A new hope may be hanging from the hook of this crane. The new vibratory ram for installing monopiles is currently being tested in a sandpit near Cuxhaven. The offshore wind industry is pinning big hopes on a new vibration process. It is designed to drive piles into the ­seabed faster, cheaper, and more carefully. ­Practical testing has been promising. The energy provider, together with E.ON, Dong Energy, ­Vattenfall and EnBW shelled out a good ¤ 6 million to glean these new insights. The British organisation ­Carbon Trust contributed a further 33 % of the project costs. The sandpit near Cuxhaven is the ideal ­testing ground because in prehistoric times it was covered by the North Sea at high tide. A total of three tube-piles will be driven into the former seabed using the vibration technique and another three using a 1,200 t pile driver made by IHC Merwede. Sensitive measuring instruments monitored the work. Then the project participants will have a break of a few weeks before the decisive phase begins in August. During that phase, a rammed tube and a vibrated tube will be tensioned against each other with a force of 20 MN. This force measure­ment is intended to provide insight into, “whether vibrated tubes have the same stability as the rammed ­variety. The emphasis will be on monopiles, which are still the preferred foundation type,” says Griesshaber. That is why the test piles, with their diameter of 4.3 m and length of 21 m, roughly correspond to the piles that will later have to stand up reliably in the seabed. For the sake of safety, authorities and certification bodies have so far required that piles have to be driven into the seabed to a depth of at least eight times their diameter. With its powerful vibration, a vibrating ram liquefies the soil, thereby driving the pile into the seabed. These are precisely the differences that are set to be examined through the testing regime. If the tests go well, they would be a big step in the right direction because every strike with the ram puts a load on the steel and ultimately takes a toll on more than just its service life. Because the vibrating ram works faster ­– and ­particularly because it is so much quieter – the participants in the project are ­convinced that the environmental noise pollution regulations that apply in some countries will be easy to adhere to, and very likely will be far below the permissible noise ­thres­holds. Both of these benefits are expected to result in significant cost savings because they will eliminate the need for noise reduction measures, such as bubble curtains or noise insulating enclosures. “That, along with the prospect of only having to work with a single machine under the right soil conditions, is the driving force behind the project,” says Griesshaber. 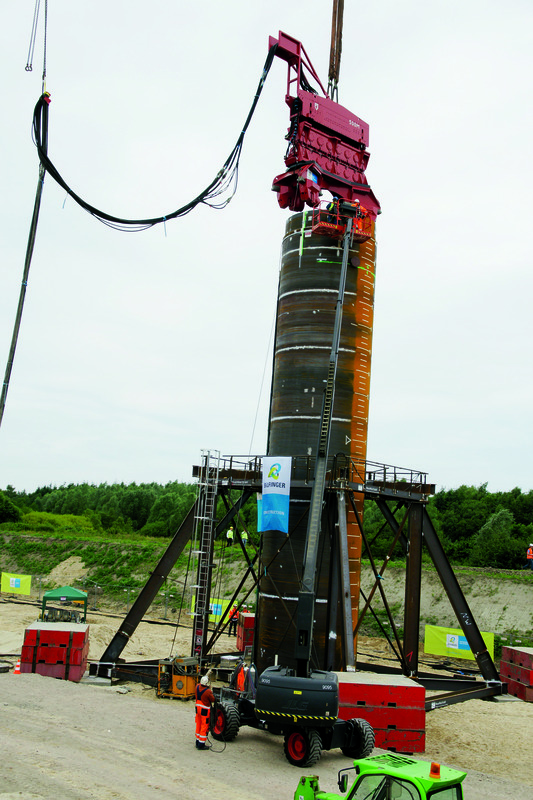 Concrete hopes are resting on a vibratory hammer made by PVE ­Piling & Drilling Rigs BV. Especially for the project, the Dutch company has designed a hydraulic power package with twelve vibrating elements. With a static moment of 500 kg the machine is currently one of the largest devices on the market and develops the equivalent of 1,000 t of energy. In the test series, a crane first places the vibro hammer into the tube. The ram is held in place on the pile by four cheeks which develop 300 t of pressure each. The ram itself is a real lightweight by comparison at just 60 t – a comparable hammer weighs some 245 t. Because these are still needed for other types of sediments, IHC Cuxhaven is trying a new ­process for the first time ever. The piles are ­driven at a higher frequency with lower energy. While that ulti­mately means more strikes to the pile, it creates less noise. During testing the noise was measured at 145 dB, which is far below the 160 dB ­allowed within a 750 m radius of pile driving in the North Sea. Sea creatures, if they could, would ­welcome the tests in the gravel pit.